drivinginnovation&roi TALENT DEVELOPMENT THE SAVVIS WAY Jim Sokolowski is the chief learning ofcer and director of Global Learning and Leadership Development for Savvis, an outsourcing provider of managed computing and network infrastructure for I.T. applications. He joined Savvis in 2010 to build a learning organization from the ground up, and during the past three years has done just that with an approach to learning that is strategic and laser-focused on impacting results. In the three-year transformation process, the Savvis learning team has been awarded the Training Magazine Top 125 Award in 2012 and 2013 and also the B.E.S.T. award from the American Society for Training and Development in 2012 and 2013. "We have come a long way in our rapid from-the-ground-up build and transformation," says Sokolowski. "I am very proud of what the team has accomplished, and I am honored to be part of this award-winning team. Te question we continue to ask ourselves, 'Now what?' To keep our seat at the table requires that we maintain relevance by staying connected to the most critical strategic imperatives. We must also continue to improve the services we provide and the solutions we deliver." Interdependence is a key element of the Savvis way. At the beginning of each year, Sokolowski and his team meet with business-unit leaders to better understand their strategies, goals and talent development needs, with the ultimate outcome of being able to link all learning solutions and eforts to the most critical organizational strategic imperatives. In addition to the annual connection point, Sokolowski's team also uses a strategic consulting process along with monthly enterprise learning dashboards and quarterly program level dashboards to regularly review learning solution progress and share the results with business-unit leaders. Tese strategies reinforce a continuous connection with the business, while also providing a mechanism to continuously improve the learning solutions the team is providing. 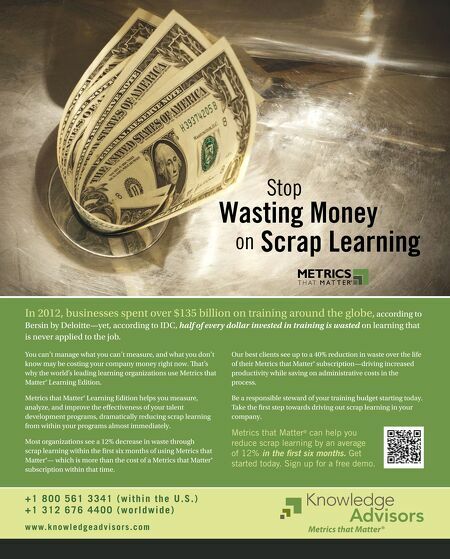 A SHARED CHALLENGE In order to ensure proftable revenue 16 October / November 2013 Elearning! 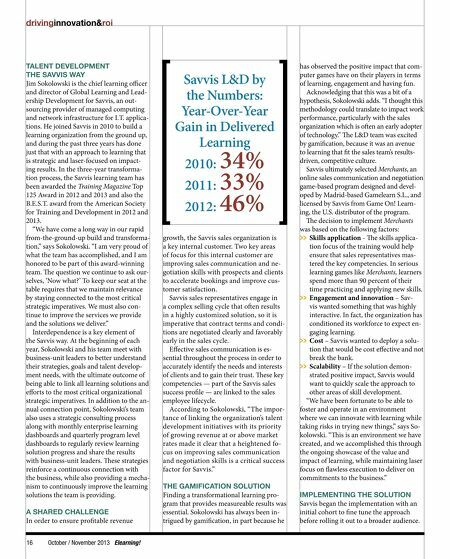 Savvis L&D by the Numbers: Year-Over-Year Gain in Delivered Learning 2010: 2011: 2012: 34% 33% 46% growth, the Savvis sales organization is a key internal customer. Two key areas of focus for this internal customer are improving sales communication and negotiation skills with prospects and clients to accelerate bookings and improve customer satisfaction. Savvis sales representatives engage in a complex selling cycle that ofen results in a highly customized solution, so it is imperative that contract terms and conditions are negotiated clearly and favorably early in the sales cycle. Efective sales communication is essential throughout the process in order to accurately identify the needs and interests of clients and to gain their trust. Tese key competencies — part of the Savvis sales success profle — are linked to the sales employee lifecycle. According to Sokolowski, "The importance of linking the organization's talent development initiatives with its priority of growing revenue at or above market rates made it clear that a heightened focus on improving sales communication and negotiation skills is a critical success factor for Savvis." THE GAMIFICATION SOLUTION Finding a transformational learning program that provides measureable results was essential. Sokolowski has always been intrigued by gamifcation, in part because he has observed the positive impact that computer games have on their players in terms of learning, engagement and having fun. Acknowledging that this was a bit of a hypothesis, Sokolowski adds. "I thought this methodology could translate to impact work performance, particularly with the sales organization which is ofen an early adopter of technology." Te L&D team was excited by gamifcation, because it was an avenue to learning that ft the sales team's resultsdriven, competitive culture. Savvis ultimately selected Merchants, an online sales communication and negotiation game-based program designed and developed by Madrid-based Gamelearn S.L., and licensed by Savvis from Game On! Learning, the U.S. distributor of the program. Te decision to implement Merchants was based on the following factors: >> Skills application - Te skills application focus of the training would help ensure that sales representatives mastered the key competencies. In serious learning games like Merchants, learners spend more than 90 percent of their time practicing and applying new skills. >> Engagement and innovation – Savvis wanted something that was highly interactive. In fact, the organization has conditioned its workforce to expect engaging learning. >> Cost – Savvis wanted to deploy a solution that would be cost efective and not break the bank. >> Scalability – If the solution demonstrated positive impact, Savvis would want to quickly scale the approach to other areas of skill development. "We have been fortunate to be able to foster and operate in an environment where we can innovate with learning while taking risks in trying new things," says Sokolowski. "Tis is an environment we have created, and we accomplished this through the ongoing showcase of the value and impact of learning, while maintaining laser focus on fawless execution to deliver on commitments to the business." IMPLEMENTING THE SOLUTION Savvis began the implementation with an initial cohort to fne tune the approach before rolling it out to a broader audience.